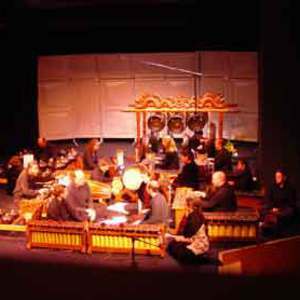 Gamelan Pacifica was formed in 1980 and is directed by composer Jarrad Powell. The group is a professional ensemble in residence at the Cornish College of the Arts in Seattle, Washington. The group performs new and innovative music in an international style, drawing their repertoire from various composers and traditions, while seeking to define a style reflective of their own musical tastes, interest, training and instincts. Gamelan Pacifica currently uses three sets of instruments: an iron and bronze set in Central Javanese style; a bronze set in Cirebon style; and an American gamelan made of aluminum. The Central Javanese and the American instruments were used on this recording. The diversity of gamelan styles in Indonesia as well as in other countries proves this to be a vital and constantly changing form of musical expression; some of the extended instrumentation heard here, such as the use of Roto-Toms, xiao-bo, or even electronic processing, can be seen as part of this evolving concept of gamelan. The effect of gamelan on modern western music has been important, influencing composers ranging from Debussy to Steve Reich. The first gamelan to arrive in the U.S. came to Chicago as part of the the Columbia Exposition of 1893. This gamelan is still housed at the Field Museum in Chicago. Eventually, through an expanding interest in ethnomusicoloy, gamelan instruments appeared on University campuses. Through the efforts of composer/instrument builders such as the American composer Lou Harrison, gamelan began to play a significant role in the contemporary music scene with its increasing emphasis on world music influences. Today gamelan instruments are found throughout the world, with many, many active ensembles in the U.S.
Gamelan Pacifica has premiered, commissioned and performed many new works by American and Indonesian composers, including pieces by Lou Harrison, K.R.T. Wasitodiningrat, A.W. Sutrisno, I Wayan Sadra, Janice Giteck, Bun Ching Lam, David Mahler, John Cage, Nancy Karp, Barbara Benary and others. The group has performed extensively in the Pacific Northwest, and has received numerous grants, including support from the National Endowment for the Arts, the Rockefeller Foundation and the Seattle Arts Commission.